Carcassonne lies on what must have been an important communication link, even in pre Roman times. The route between the Atlantic ocean and the Mediterranean Sea falls naturally between the Black Mountain to the North and the the high Pyrenees to the South. Archaeological excavations have revealed the remains of a fortified town (or oppidum) here, including huts with walls made of clay mixed with stones and straw, and with tiled roofs. These have been dated to the 6th century BC, and were probably attributable to the Iberian peoples. About 300 BC a Celtic tribe, called the Volcae-Tectosages, came from Central Europe east of the Danube. They fought and defeated the indigenous Iberians and settled in the place we now know as Carcassonne. Little is known of them. Within a few years the Romans controlled the area. For more about the Romans in Carcassonne see below. By 122 BC the Romans were in control of the Narbonnais area and settled in Carcassonne. By 70 BC Roman Carcassonne was classed as a city. The first stone walls of Carcassonne date back from this period. There is little outward evidence of it, but if you walk around the lices between the two sets of city walls, in places where the inner wall has crumbled, you can see among the rubble in-fill small cordons of red bricks dating from this period. Characteristic of the period are zigzag walls, punctuated by towers, both designed to withstand battering, to which straight walls were vulnerable. In 350, the Francs took the city, but it was quickly re-taken by the Romans. The fourth century brought great instability as the Roman Empire crumbled. The Visigoths were the next to arrive in the Languedoc. Despite its newly reinforced city walls, Carcassonne fell to them in AD 436. A walled city was built in the 5th century by Euric I, King of the Visigoths. Under their Christian king Theodoric, they controlled what we now know as Provence, Aquitaine and the Languedoc (Septimania). The Visigoths were not considered great builders. They did however maintain the walls, copying the Gallo-Roman art and style. For this reason it is not easy differentiate Gallo-Roman constructions from the Visigothic ones. (throughout the Languedoc, many Gallo-Roman constructions were wrongly attributed in the nineteenth century to the Visigoths). In 508, the Franks reappeared. Under Clovis they launched an attack against the Visigoths. They took the city of Toulouse, and Gondebaud, king of the Burgondes, was given the task of taking Septemania, but he failed to capture Carcassonne. Although Clovis succeeded in unifying most of Gaule, he could never control Septimania without Carcassonne - its great defensive gateway. Carcassonne and Septamania remained Visigothic until they fell to the Moors (Saracens) in 725. Early in the 8th century, the Saracens crossed the Pyrenees from the Iberian peninsula and moved northwards, taking Carcassonne in 725 AD. They renamed the city Carchachouna. In 759 under Pepin the Short, the father of Charlemagne, the Saracens were driven out of Septimania and back over the Pyr�n�es. (A very distorted and anachronistic version of the siege provides the famous story of Dame Carcas). The Francs introduced the Germanic tradition of building in wood. Some authorities believe that a wooden palisade would have defended of the enceinte (stone wall), but no trace has been found - and the benefits of defending a stone wall with a wooden one are not obvious. The defensive system of the Roman fortification did not change much. The means of attack started to improve and the first machines of war since Roman times appeared. 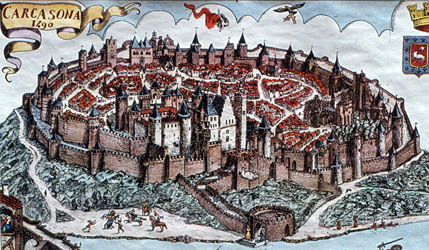 Carcassonne and the area around it, the Razes, now became part of the County of Barcelona. In 1082, Bernard Aton Trencavel, Viscount of Albi, Nimes and B�ziers was proclaimed Viscount of Carcassonne. For over a century, between 1082 and 1209 the city of Carcassonne enjoyed tremendous influence under the Trencavels, a family closely related to the family of St-Gilles, Counts of Toulouse. The Trancevals were Counts of Albi, Carcassonne, the Raz�s, B�ziers and N�mes, but they ceded their possessions for political reasons to the King of Aragon and recieved them back as Viscounts. At this time Carcassonne saw great prosperity: Taxes from merchants sometimes reaching half the value of the products. Two boroughs grew up outside the city called Saint-Michael and Saint Vincent. The city was then divided into 16 ch�tellenies. This was a common feudal practice by which the city was divided up between senior vassals, each of whom was responsible for part of the defences - typically a stretch of wall and one or two towers. Important construction works were undertaken on several points including the "Count's Castle". 1096: Pope Urbain II blessed the materials to be used to build the Church of Saint-Nazaire. 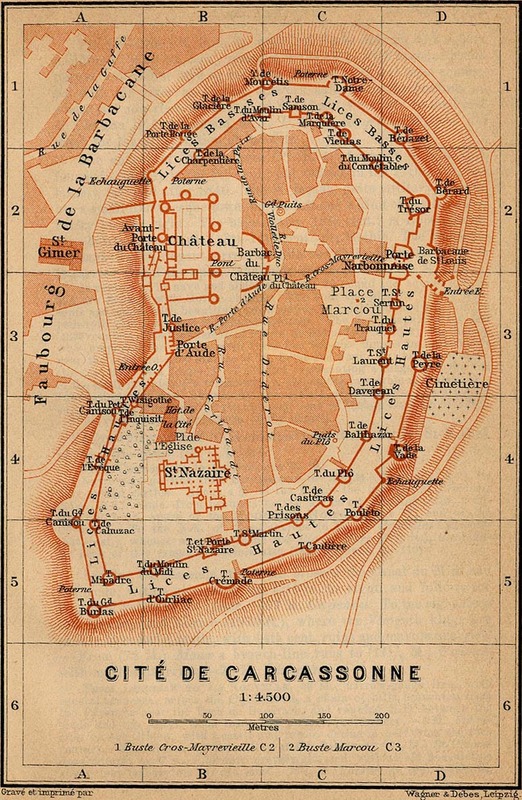 1130: Construction of the Chateau Comtal, and the restoration of the Gallo-Roman walls. 1209 (August 1-15thst): Raimon Roger Trencavel is besieged during the Crusader wars against the Cathars. 1240: Raimon Trencavel attempted unsuccessfully to win back the city of Carcassonne. The inhabitants of the Saint-Vincent were punished for their support. They were burnt and the old borough destroyed. For over a century, between 1082 and 1209 the city of Carcassonne enjoyed tremendous influence under the Trencavels , a family closely related to the family of St-Gilles, Counts of Toulouse. The Trencavels were Counts of Albi, Carcassonne, the Raz�s, Béziers and Nîmes, but they ceded their possessions for political reasons to the King of Aragon and recieved them back as Viscounts. The medieval period also saw the rise of the Cathar religion. Raymond-Roger Trencavel, Viscount of Carcassonne was sympathetic to this religion and offered Cathars refuge on his lands. The young Count was not wise enough to enter into the alliance offered by his uncle, Raymond VI of Toulouse, nor to distrust the duplicity of the Catholic Crusaders. Consequently, he ended up dying a miserable death in his own prison at the age of 24, a scandal at the time which is not forgotten even now. Carcassonne continued as a fortress city under the French invaders. In 1247, the City, along with other possessions of the Viscounts of Carcassonne were formally confiscated by the French crown. Click here formore about the role of Carcassonne in the Cathar Wars . In 1247, the City, along with other possessions of the Viscounts of Carcassonne were formally confiscated by the French crown. In 1248 Carcassonne was re-fortified. Louis IX built a second outer wall. All these constructions are recognisable because of the use of a technique then fashionable: "bossed" stones, ashlars with the outer face left rough. Carcassonne and her five sons, now provided a strong line of defence against the Kings of Aragon, who still owned the Roussillon at this time. These new defences were tested 1355 when the Black Prince (Le Prince Noire) arrived to sack the sack the city. The unfortified Ville Basse was completely destroyed. It was immediately rebuilt and is now known as the Ville Basse. In 1659 the old Province of Roussillon passed to France under the Treaty of the Pyrenees, and Carcassonne ceased to be a frontier fortress. The old Cité was left to decay, like the other frontier castles and was abandoned during the 18 th century. As in many redundant medieval buildings throughout Europe, stone were extracted for new buildings, or to shore up old ones. The roofs of the towers fell into ruin. A decree of 1850 condemned the whole of the fortifications to demolition. "I doubt that there exists anywhere in Europe as complete and formidable a system of defence of the 6th, 12th and 13th centuries, as interesting a subject of study, and a more picturesque situation". Around 15 % of the city was repaired. Crenelationss were rebuilt, roofs remade and vaults consolidated. The work of Viollet Le Duc was continued after his death in 1879 by one of his student, Boeswillwald, and later by the architect Nodet. Some later historians and architects have claimed that this restoration work removed the authenticity of the monument, and some have quibbled about small mistakes , but the consensus is that the whole world owes a great debt to the skill and energy of Viollet Le Duc. The medieval walled Cité and the modern city (Ville Basse) lie on opposite sides of the River, linked by a bridge, The two cities have always been very different, the ancient one a royal stronghold, the new one bustling with activity. The Following sites give a wide range of information about Carcassonne. La Cit� de Carcassonne: Excellent site. Highly recommended. A personal site by Philippe Cuq and Bruno Bernier with pictures and a "guided tour". Official tourism site: Run by the Tourist Office. Slow. Mescladis: pretty pictures but slow without high bandwidth.